Bethania’s newsletter is printed once a month. It is available on-line. It contains articles from Pastor Chris Brown, activities of the church, meeting updates, photographs and a monthly calendar. See the Children and Family Page for Activities geared to Youth. All women who attend Bethania are a part of the Bethania Lutheran Church Women (BLCW). We gather together occasionally to enjoy a time of fellowship, singing and a program to help us grow in our faith. These meetings are a wonderful way to meet new members and visit with old friends. The BLCW also includes small groups which help women live their faith through ministry and action and study. The Quilting group meets on the second Wednesday of the month to tie and sew quilts for Lutheran World Relief. http://lwr.org/quilts Fabric, batting and thread are provided. The BLCW also provides scholarships through donations from the entire congregation for two girls and two women at the Pace Universal School in India. Correspondence is received from these recipients so the congregation is kept informed of their progress. In the Fall a Thankoffering is gathered in support of the Women of the ELCA. BLCW members also have the opportunity to attend Spring Central Coast Cluster meetings and the Southwest California Synod Women of the ELCA convention or retreat held in the Fall. All are invited to join in the fellowship and opportunities to serve offered by this organization within the church. 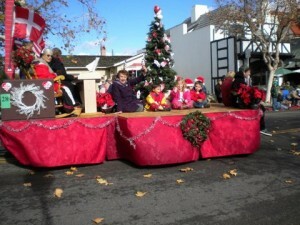 The Events Committee at Bethania has often sponsored groups and floats for local parades at Christmas and Danish Days. Entries have often earned us recognition for creativity and have included giant figures of famous Danes, replicas of Danish Christmas plates, and traditions like singing around the Christmas tree. These entries share not only our history and traditions, but also our on-going ministry in the community. Over the years Bethania has hosted many wonderful concerts for the community. Each year at Danish Days we host an organ concert featuring a wide variety of musical offerings that are not only entertaining but that also highlight our Phelps pipe organ. We have hosted many different choirs and other choral groups from colleges both local and distant. All of these have provided a wonderful opportunity to share the beauty and majesty of music with the congregation and the community at large. Each year our Christian Education Committee along with Social Ministry and Outreach work together to host a community-wide Halloween Party for children and their families. The Parish Hall is turned into a fun-filled spooky center with activities, games, and food for all. People from across the valley come to enjoy an evening of entertainment for children and adults alike in a safe, loving and well-supervised environment. On the Saturday before Easter, the sidewalk in Front of the church is filled with families on their knees. 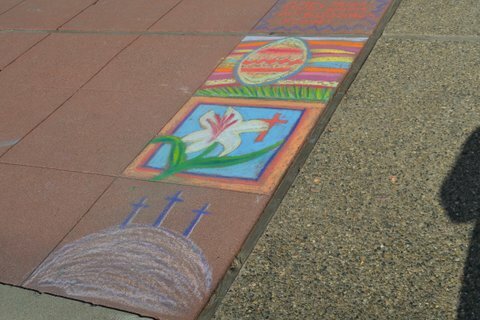 They are creating beautiful chalk drawings for Easter Sunday morning. The drawings are of lilies, eggs, flowers, crosses, bunnies and more. Easter Sunday morning, the walk into church is lined with these beautiful and colorful images of Easter.